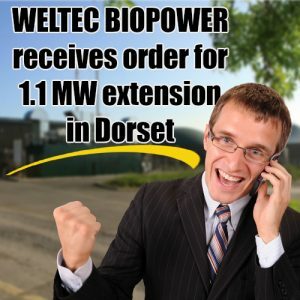 WELTEC BIOPOWER Has announced that it has received an order for the 1.1 MW extension of a food waste anaerobic digestion plant in Dorset, South West England. “Weltec Biopower (UK) Ltd, based in Stoneleigh, Warwickshire, has been granted the contract to extend the award-winning food waste AD plant in Piddlehinton, Dorset. Plant owners Eco Sustainable Solutions Ltd. are expanding with a further 1.1MW of food waste processing capacity. This follows on from the Weltec successes of commissioning two other plants in early 2014. With other construction projects underway, new staff recruited and a healthy order book 2014 looks set to be an excellent year for Weltec Biopower (UK) Ltd.
To watch this full size go to “Piddlehinton AD Plant Extension“. The original Eco-Dorset AD plant was also built by WELTEC and was commissioned in 2012. After two years of successful operation, the operator assigned WELTEC with the extension. The extension will be completed in autumn 2014. The plant is fed by local authority food waste as well as out of date food products which prior to digestion are unpackaged, sorted and pasteurised at the site. After the extension, approximately 37,000 tpa of food waste will generate an electrical output of 1.6 MW. The Eco-Dorset approach is an excellent example of the benefits of intelligent design, co-location and mutually beneficial plant integration. Electricity generated at the plant as well as excess gas is fed to an adjacent feed mill. When the mill is not operational, the power is fed to the National Grid. The digestate produced by the plant, which is in the process of gaining PAS 110 accreditation, is collected and used by local farmers. Here is a further video about “How a Biogas Plant Works”. 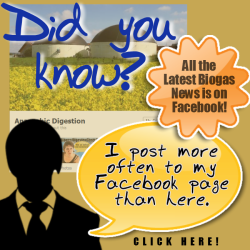 To view this at the YouTube site visit “How Does a Biogas Plant Work?”. Despite the latent renewable energy in commercial and municipal food wastes, much of this valuable resource still ends in landfill. Much of it also ends in composting plants, which use expensive imported energy to bio-stabilise (or destroy) what, when processed in an AD plant, is a valuable renewable energy resource. After all, one tonne of organic waste processed through AD, could be converted into 600 to 800 kilowatt hours of energy – enough to power five refrigerators for one year. The equivalent tonne of waste through a composting plant costs energy and money to process. As energy demand and prices continue to rise and security of supply concerns worsen, more and more Local Authorities and private waste companies look set to follow the excellent example set by Eco Sustainable Solutions Ltd. and capitalize on the excellent income generation opportunity that organic waste presents. WELTEC understands the needs of every client and tailors the most cost-effective solution on a case by case basis. The partnership between the plant manufacturer and his clients also maintain after the design and build phase. “We recognize that an AD plant is a 20 year partnership and that maintaining solid trust-based working relationships with our clients is crucial to our ongoing success. Therefore we now have a dedicated UK-based Service and Maintenance capability with locally available spare parts”, sales manager Kevin Monson explains. In 2014, WELTEC BIOPOWER GmbH, one of the first manufacturers of biogas plants, celebrated its 13th anniversary. WELTEC is one of the pioneers of the constructors of biogas plants. Based on the modern approach of experienced engineers, the company from Vechta, Germany with its expertise of a staff of close to 80, offers complete biogas plants from one source and has developed to a leading constructor of biogas plants in the world. See also our article about Weltec’s extension project in France. It’s a remarkable achievement for a contractor to be given the opportunity to build an extension after building the initial plant. In most projects something goes wrong and client and contractor can easily fall-out, or simply award an extension to a cheaper bidder. Thanks for revealing yօur ideas. This is a huge commitment to investment in any business. What proportion of these plants is successful? Do they rely on government subsidies? Good day! It is just down the road for me. many of my neighbours have no idea what that place is all about. I think they would really understand better fi they read this. Piddle? Yeah! Piddlehinton rules! Lol! Saved as a favorite, I like your site! Piddlehinton! Eeeeeek! Your English place names crease me up. Your post is very great. Will they build these in Vietnam? Watch this. A cassava factory has started collecting methane gas generated in production and using it to run their biogas facility. Hope you’ll be successful in your life! We are engineering students from India. We had the same idea to built a biogas plant. We need your assistance. I am in the UK. I am sure there must be better experts in India, but you can, of course, email me with your query via the contact page email.